I find that my watch photos get 'borrowed' fairly regularly - but then again, I'm probably just as guilty of doing that myself, if I'm honest. This one ranks at, or near, the top. 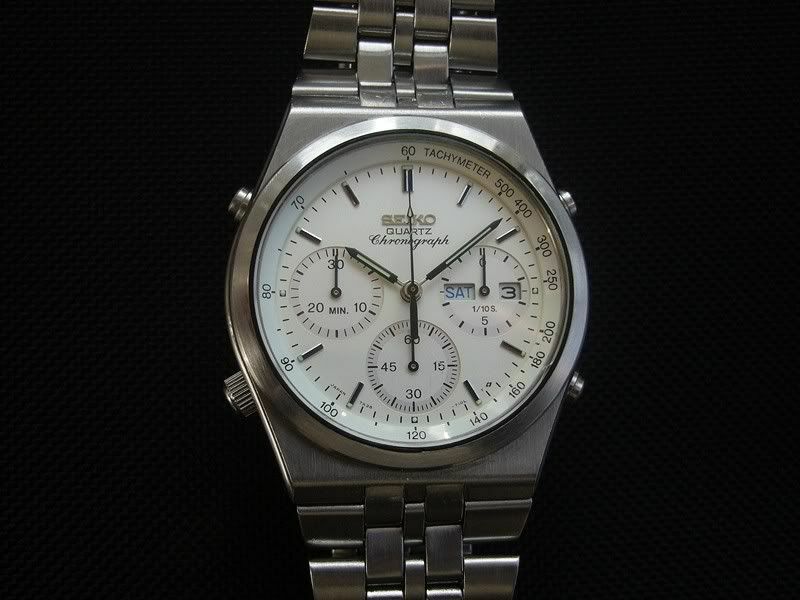 It is an example of the first analog quartz chronometer. chronometers. Mine is exceptionally accurate; seconds a year. If you click on the image in the original Watchuseek post, the formatting of the photo caption may look familiar to some on you. It's not difficult to deduce that the Timezone poster had right-clicked and saved it (complete with my original caption) from there. Funny thing is, I didn't actually win that eBay auction, back in January 2009. But that is my watch and I still own it - it's one of my regular everyday wearer stainless 7A38-7280 beaters (now refurbished and fitted with a Sternkreuz white nylon crystal gasket). As I've written elsewhere in a couple of threads, in an effort to explain, one of the main reasons that I made the three most trafficked sections of 'The Watches' form sub-section 'private' (i.e. visible only to signed in forum members) was to stop poaching of my photos. But I've deliberately left the 'eBay' and 'Workshop' sections viewable to the wider internet public. Trouble is there are quite a lot of decent photos (both mine and other contributors) in those sections. I was browsing the Italian Subito.it free classified advert site this morning. Guess what I found ? Yup - it's one of my stainless 7A38-7280's again ! This particular stainless 7A38-7280 also happens to be fitted with a white nylon Sternkreuz crystal gasket (p/n IG318310H). The photo's been lifted from the Crystals and Gaskets thread (scroll to my second post on page 1) - in the Workshop section ! Raffaele will be hearing from me in due course. Cheeky b*st*rd ! Never fearful of exposing my ignorance or of asking stupid questions, is there no way for websites to ensure that pictures included in auction offerings are indeed pictures of the object on offer? And not just representative photos--sort of a multipixel version of the stick-figure drawings Saturday Night Live would use, tongue-firmly-in-cheek, to "illustrate" their courtroom reports--but real honest to God photos, ideally with a Proof of Life photo of a newspaper dated the day of first appearance alongside the timepiece. The question is: Do they care ? Answer: Particularly with the likes of eBay who are only interested in profits from commission on sales is unfortunately, No. The better the photo (regardless of whether it's of the actual item for sale), the quicker it sells and they take their 10% cut. Probably the best 'classic' example of that recently was 'Honest Joe' Harrison using a copyrighted photo of Brandon Cripps' 7A28-7120 RAF Gen. 1 (lifted from Brandon's Worn & Wound article) to try and flog the bent and battered example shown in his other photos. 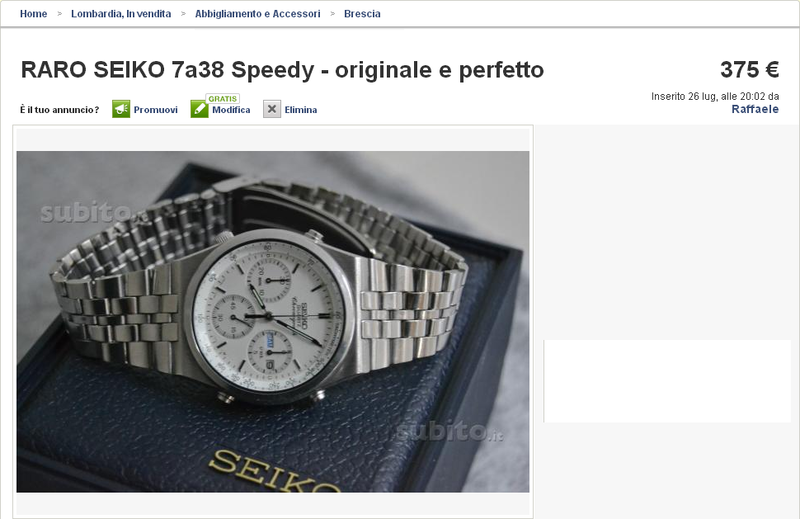 Il venditore non possiede questo orologio. E 'il mio orologio. Sto portando come scrivo. Raffaele ha rubato la foto dal mio sito. Si prega di rimuovere questo annuncio. 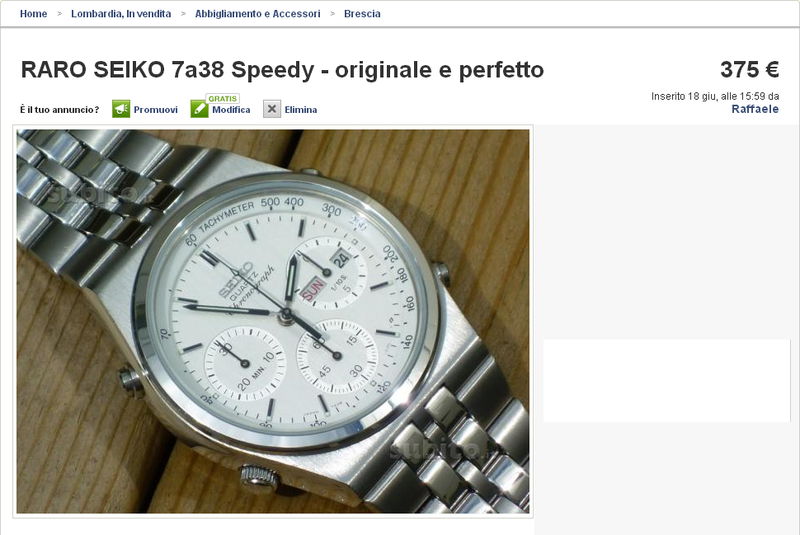 L'orologio è un valore di circa 75 €, per inciso. Impressive how quickly Subito.it acted to remove the advert in response to my reporting it. Less than an hour later - it was gone ! I noticed (only) today that the advert had been re-instated later that evening - but now Raffaele is using one of his own photos. Still the same 'pie-in-the-sky' 375 Euros asking price though. Note the (correct original) black nylon crystal gasket clearly visible.